A new entertainment complex is coming to a former strip of industrial land along the north branch of the Chicago River. 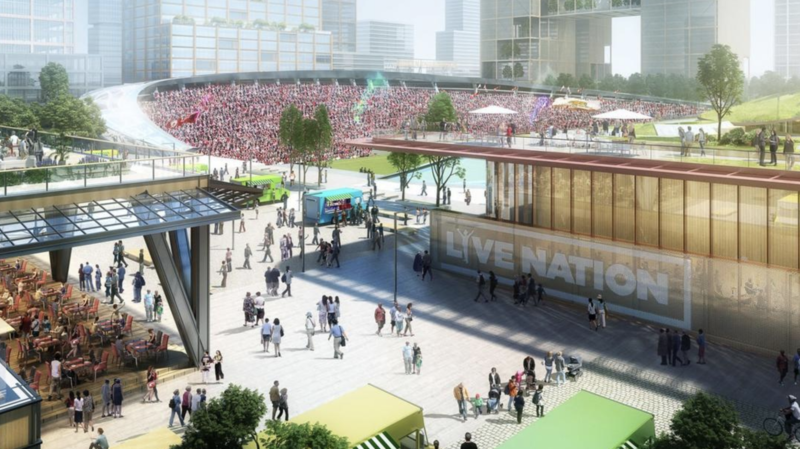 Live Nation has partnered with Sterling Bay to create a year-round entertainment district within a proposed 70-acre north branch development project, Lincoln Yards. This announcement occurs one week after Chicago Cubs owner Tom Ricketts revealed that a United Soccer League team and stadium will be the central focus of the entertainment complex, the Chicago Tribune reported. The complex delivers three to five entertainment venues along with a reported 20,000-capacity soccer stadium. Each of the smaller venues will range from 100 to 800 seats. Beverly Hills, California-based Live Nation is on board to book and manage events, as well as fund construction. Pending city and zoning approval, Sterling Bay plans to begin construction within 18 months. A corporate parent of TicketMaster, Live Nation adds cache to the complex. No other retail tenants or partners have been announced. The complex is proposed on the former site of the A. Finkl & Sons steel plant site, a steel mill that operated along the Chicago River in Lincoln Park for 112 years before being demolished in 2016. Amazon representatives were spotted at the site last fall, sparking speculation that the 28-acre tract of land could be proposed for the coveted HQ2. The Lincoln Yards site also includes a former fleet management complex Sterling Bay purchased from the City of Chicago, as well as other smaller pieces of land along the river. Renderings released by Sterling Bay for the entertainment complex reveal a series cantilevered pavilions, along with a sloping, horseshoe shaped soccer stadium. The entertainment complex complements other aspects of the Lincoln Yards development, which will be mixed-use retail, office and residential with an extension to the 606 trail. The architect/developer David Hovey has designed buildings in the Chicago suburbs as well as city neighborhoods outside of downtown. 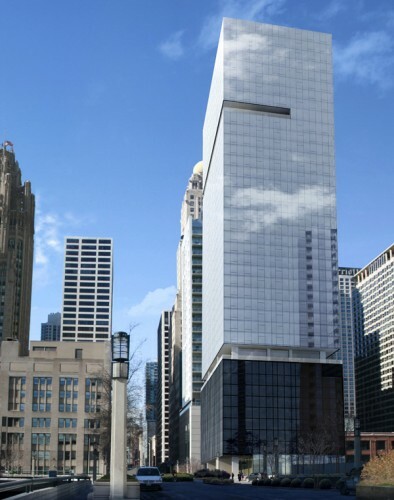 With the Optima Center Chicago, he is making a 42 story debut just north of the Loop. The luxury rental tower will have 325 units. Hovey is bullish on the building's potential. "All our market research shows a lot of demand for rentals in that area," he said of Streeterville. The units will sit on top of nine floors of parking as well as 20,000 square feet of commercial space. Hovey thinks the building's location--walkable to the Loop, the Lake, and the Magnificent Mile--will make it appealing to upper-end renters. Amenities will include 10th floor recreation center and a sky deck on the 42nd floor concealed behind an ultra-smooth glass curtain wall.